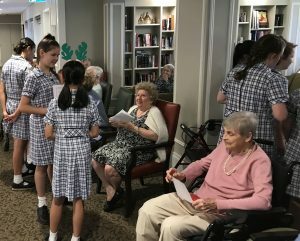 On Monday and Wednesday this week St Thomas Year 6 students visited BUPA and Elizabeth Lodge Nursing Homes to sing Christmas Carols. We had such a great time singing the carols, meeting and chatting with the residents at both homes. It was a joy to see the smiles on their faces and it really made the two visits worthwhile. In return we received a lovely rendition of Silent Night performed by the residents at BUPA.